ABOUT PRODUCT AVS Audio Converter is one of the top leading programs for converting audio files into the format you need. Convert audio files between MP3, OGG, FLAC, APE, AAC, M4A/M4R/M4B, AMR, WAV, VOX, VOC, SHN, audio TS, and other formats. In addition to converting audio tracks you can trim, delete parts, merge files, apply effects and use batch mode to convert several files at one go.A… VS Audio Converter offers ready-to-use quality presets as well the customization of conversion profiles to satisfy your needs. The program allows you to export audio from video, edit audio tracks, create ringtones for your iPhone and make your own audiobooks. 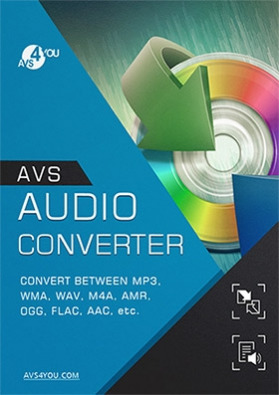 AVS Audio Converter is a simple-to-use program that stands out from other applications thanks to a clear interface, a large number of supported formats, and a handful of extra features you usually don't find in similar programs. AVS Audio Converter is a part of AVS4YOU package. Buy AVS Audio Converter and get 10 AVS4YOU multimedia programs as a gift. AVS4YOU tools let you easily convert and edit audio/video/image/document files, burn DVDs, create ringtones, upload videos to portable devices, players, phones and much more! TECHNICAL DATA Windows 10, 8.1, 8, 7, XP, 2003, Vista Minimum System Requirements Processor: Intel / AMD compatible at 1.86 GHz or higher RAM: 1 GB or higher Sound: Windows compatible sound card DirectX: Microsoft DirectX 9.0c or later Administrative permissions for program installation and activation Internet connection to activate	Recommended System Requirements	Processor: AMD / Intel Core 2 Duo compatible at 2.4 GHz or higher RAM: 2 GB or higher Video: Windows 10/Windows 8.x/Windows 7 compatible video card Sound: Windows 10/Windows 8.x/Windows 7 compatible sound card	Note: System requirements may differ depending on the Windows 10/Windows 8.x/Windows 7 version installed and increase when Windows Aero interface is enabled.